Ryan Gosling has forged quite the career from marching to the beat of his own drum; his acting roles are picked based on what interests him as opposed to coasting on his looks and charms all the way to the bank, and now, with his first directorial feature, he’s created a bamboozling piece of arthouse cinema in the vein of his mentor Nicolas Refn, and idols like David Lynch, Dario Argento and Gaspar Noe. Film buffs are sure to have a ball playing spot the influence; Gosling proudly wears Blue Velvet and Mulholland Drive on his sleeve, through the lens of Only God Forgives. Like his acting roles, this isn’t concerned about pleasing the mainstream; in fact, judging by its Cannes reaction and Rotten Tomatoes score it isn’t pleasing anybody. Critics are writing it off as a collage of influences on a canvas with no originality of its own; and while it is a collage of influences, to write it off as nothing more is lazy journalism. Whilst displaying images reminiscent of its idols, it contains enough of its own symbolism and messages to warrant some respect in regards to its originality. Gosling tackles issues like small town life, poverty, bullying, family, coming of age, and the environment in his first outing; Christina Hendricks plays the mother who goes to desperate lengths to support her family, leading her into a dark underworld overseen by Ben Mendelsohn’s Dave, a sleazy Luciferian-like scumbag with a fondness for karaoke. Saoirse Ronan plays Rat, the young love interest of Bones (Iain De Caestecker), who spend their time ducking bullies led by the appropriately named Bully, played by Doctor Who himself, Matt Smith, in career best performance thus far. Their town is decaying as a result of the economic crisis, and the setting makes for a desolate urban fairytale. 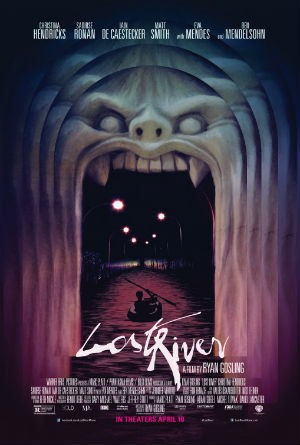 Water plays an important part in Lost River; in a town where water is hard to come by, all the characters still seem to be drowning in one way or another. Social commentary is playfully used to suggest that industrial and commercial growth has replaced reservoirs to the point nobody knows what they are any more, despite being necessary in order to survive.